Along with obstructing arterial and venous blood vessels, blood clots commonly break free, travel through the bloodstream and cause heart attacks, pulmonary embolisms or strokes. Seniors and their Oshkosh home caregivers can reduce the likelihood of developing vascular problems by minimizing other risk factors. Atrial fibrillation, diabetes, high blood pressure and high cholesterol are examples of medical conditions often diagnosed in older adults. If seniors do not seek medical treatment, the ailments can cause plaque and blood clots to form. Seniors must take medications as directed and make follow-up appointments as recommended in order to maintain optimal health and prevent further complications. Smoking constricts blood vessels, which impedes circulation and causes clot formation from pooling blood. Quitting is often more difficult for older loved ones as they may have been smoking for decades. Ultimately, giving up the habit must be their decision. However, there are many options available to ease the cravings and stress. Breathing, sweating and eliminating bodily waste cause fluid loss that must be replaced. The increased temperatures during certain times of the year cause greater fluid deficits, which in turn causes blood to slow and clot in the bloodstream. Oshkosh, WI, elderly care providers recommend that adults consume at least two liters of fluid everyday to stay hydrated and prevent blood from clotting. Seniors should stand and walk around every one or two hours. Sitting for extensive lengths of time slows blood circulation in the legs to the point that a clot may form. Having someone simply move around and stretch the lower extremities keeps blood from clotting, especially among seniors confined to a wheelchair. Getting a sufficient amount of exercise helps keep the cardiovascular system working properly and prevents blood clot formation. Going for a 30-minute walk at least three times a week is a vast improvement for anyone who has been predominately sedentary. Over time, seniors may then increase the level and intensity of activity. By encouraging your loved one to engage in the above activities, he or she can reduce the risk of blood clots and related medical issues. 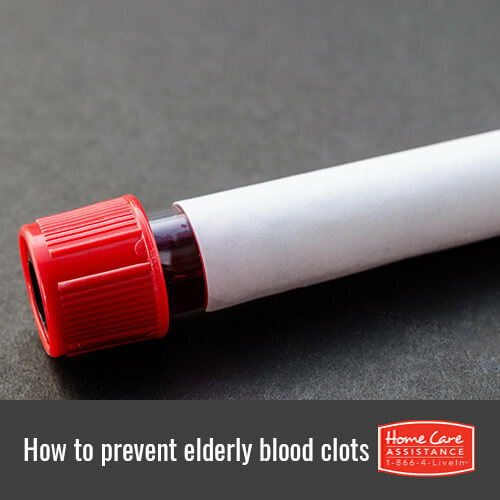 You can further reduce your loved one’s risk of blood clots by hiring Home Care Assistance of Oshkosh. We provide specialized Alzheimer’s, dementia, and stroke home care in Oshkosh that encourages seniors to eat healthy foods, exercise regularly, and adopt other healthy habits that promote longevity and wellbeing. Set up a free in-home consultation today by calling (920) 710-2273 to speak with a trusted Care Manager.